There's a touch of irony in the career trajectory of Michael Fogg. He started out a dozen years ago as a cabinet-maker, crafting and installing wooden bookshelves, cupboards and carvings. But he found the competition stiff and the road to success steep. Then one day he came across a magazine article about Carlos Cortes, a San Antonio-based maker of concrete "faux bois" furniture that looks and feels like wood. Fogg taught himself the craft, partly by watching videos on the web, and in 2012 made it his main occupation. Good move. That journey from the real to the artificial has put Fogg among a small group of artisans reviving and popularizing the 19th century art of faux bois, which lasts longer and allows more creativity than actual wood. Patsy Pittman Light, the author of Capturing Nature: The Cement Sculpture of Dionicio Rodriguez, figures that there are perhaps a dozen professionals, at most, handcrafting faux bois objects in the United States. At 38, Fogg is in a sweet spot: He is keeping the tradition, but experimenting with new techniques and aiming for a slightly lighter aesthetic than his peers. "I'm bringing the art into more modern times," he says. "I want to update it." Among his creations are tables held up by bonsai branches and chandeliers with slender, graceful branches. As the name suggests, faux bois originated in France, where about 150 years ago Joseph Monier, a gardener who helped invent reinforced concrete, built a bridge at the Chateau Chazelet. Covering the guardrail frames with concrete, he fashioned them to look like weathered logs – with bark and knots and twigs. Before long, rusticity was fashionable. Monier's faux bois techniques spread in Europe and jumped across the Atlantic. As Light relates, starting in the 1920s, Rodriguez, a Mexican faux boix genius, brought his art across the border into the Southwest, especially San Antonio; he spawned followers, including his great-nephew by marriage, Cortes, whose work had attracted Fogg. 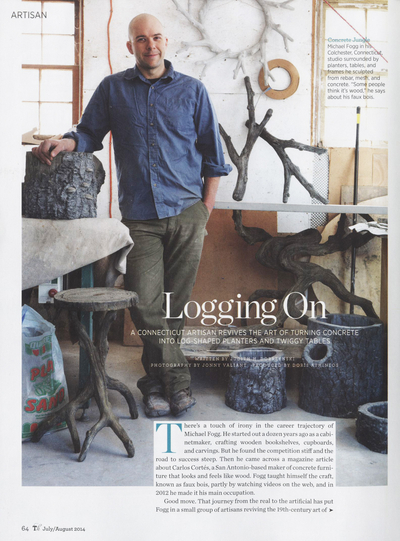 On an early spring day early this year, Fogg is working in his rural Connecticut studio on the pedestal of a birdbath (or maybe an elevated planter, depending on who buys it). "Usually, I do a sketch. I put some measurements on it, and that's it," he said. "This is the opposite of woodworking, which has to be perfect, or it doesn't fit. With this, there are no rules, except that it has to work structurally." Guided by his small sketch, he had already welded together the reinforcing bars that formed the basic shape, or armature,, of the pedestal – a thick wood trunk and two smaller branches. And he had covered that with stucco lath, a galvanized steel mesh that will hold the successive layers of concrete. Now he iis mixing a small batch of Portland cement and pozzelans, tiny reactive particles like fly ash, to make concrete. Despite the 55-degree temperature in the studio, he would have just about 20 minutes to apply this first layer, known as the scratch layer, before it would grow too hard. Fogg picks up a small scalpel and gets to work. Then he takes a fork to make thick grooves that will provide a textured base for his next layer, the sculpting layer. That requires a trip back to the metal mixing bowl. Like many faux bois artisans, Fogg developed his own secret concrete formulas and tinkers with them from time to time. "The less water, the stronger the mix is, but the harder it is to work with," he explains. "I like it to be like cream cheese, but pie dough is what you get if you don't add enough water." On this day, he gets cream cheese, which gives him more time to work on sculpting – perhaps a few hours – before it hardens. He lathers it on with a spatula, then picks up various tools, from a trowel to a pointed spatula to a two-inch paint brush to a wire brush to a serving fork. Sometimes he uses his fingers. As he worked, wood grain and bark emerge from the concrete, as do knots and burls. "I just put in a wound, this tree suffered," he says. "It had termites." Then he adds a long, deep crack with a trowel. Later, he will finish the piece with a proprietary process that both adds color and seals the surface. The end product can withstand harsh weather. Though he works from his own imagination, Fogg says he sometimes brings in a piece of bark for inspiration. "Every time I walk in the woods, I see something and say to my wife, 'look at that bark' and sometimes I come home with a piece of it." One of the attractions of faux bois is the whimsy. In Fogg's studio, for example, an almost finished chandelier sported a knot with a face ("That's the silliest thing I've done, and I wasn't sure about that," he says). Planters (wood-grained inside and out) wore little bits of bracket fungus or a snail shell. Faux bois fits well in many homes as well in gardens and lawns, and Fogg has made benches, stump planters, tables, chandeliers, sconces, mirrors and an arbor. For a recent distribution agreement, Fogg is making floor models that will be shown in David Sutherland's design showrooms – but each piece will be unique. And he is experimenting. "I'd love to do larger structures--a pergola, fences, railings and porches," he says. Bigger still, he adds, "I want to make a faux bois glass house, a conservatory."